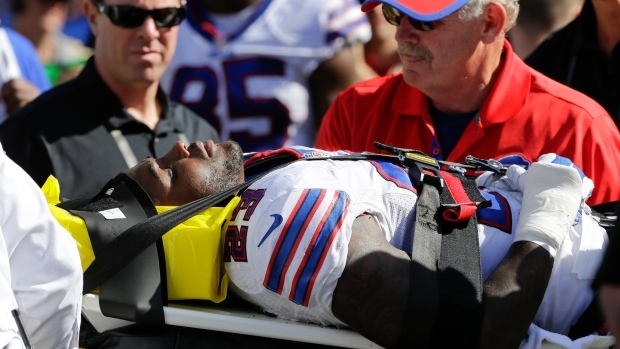 ORCHARD PARK, N.Y. - Bills starting safety Aaron Williams will miss at least eight weeks because of a neck injury after being placed on the reserve-injured designated to return list on Wednesday. The move comes after Williams aggravated the injury and missed a few plays in a 14-13 win at Tennessee on Sunday. Under NFL rules, Williams can return to practice in six weeks, and be eligible to play two weeks later. Williams had missed two games after hurting his neck in a 40-32 loss to New England on Sept. 20. He briefly lost feeling in the left side of his body and was driven off the field by an ambulance and taken to the hospital. Williams has been a five-year starter in Buffalo since being selected in the second round of the 2011 draft. He's a hard-hitting player who successfully made the switch from cornerback to safety in 2013. Buffalo (3-2), which hosts Cincinnati (5-0) on Sunday, filled the open roster spot by signing safety Josh Bush. Bush played three games with Denver before being released by the Broncos on Oct. 1. He was selected by the Jets in the sixth round of the 2011 draft and played 35 games in two-plus seasons in New York. He is reunited with former Jets coach Rex Ryan, who is now coaching the Bills.